It happens to many men in their 40s. You wake up one day and realize you're flabby and out of shape, a mere shadow of your former youthful, vigorous self. You're not 20 anymore, and your daily donut and beer habit is catching up with you. So you buy a gym membership, lose a bunch of weight, and suddenly - to the alternating delight and disdain of your Instagram followers - your life is all about getting swole. You may even start participating in triathlons, hellbent on crushing your age bracket. But unemployed Osaka resident Nishimura Kazuki (西村一紀) took a different path, and used his newfound powers for evil. Local police recently took Nishimura into custody after discovering he was the party behind a series of office building break-ins between 2017 and 2018 in which around ￥9,450,000 (appr. USD $86,000) was stolen. Nishimura tells police that he stole in order to support himself. But it's how Nishimura did it that caught police's fancy. Nishimura is apparently a dedicated gym nut who can bench press an impressive 245 pounds. Rather than enter a bodybuilding contest, however, Nishimura used his strength to scale the walls of office buildings, using emergency escapes, ladders, and even air conditioning units to make his way to unlocked entrances. Reports say he was so deft that he could scale five stories in under a minute. Nishimura's year and a half long crime streak came to an end when he accidentally dropped the key to his building at one of the offices he sacked. However, according to someone familiar with the investigation, Nishimura was difficult to catch: he craftily evaded cameras, and even managed to shake police officers who were trailing him. He was finally caught in the act when an officer, after losing sight with him, looked up and found him scaling a building wall. Nishimura's strength, dexterity, and fleetness of foot led his captors to dub him the "Ninja" bandit. 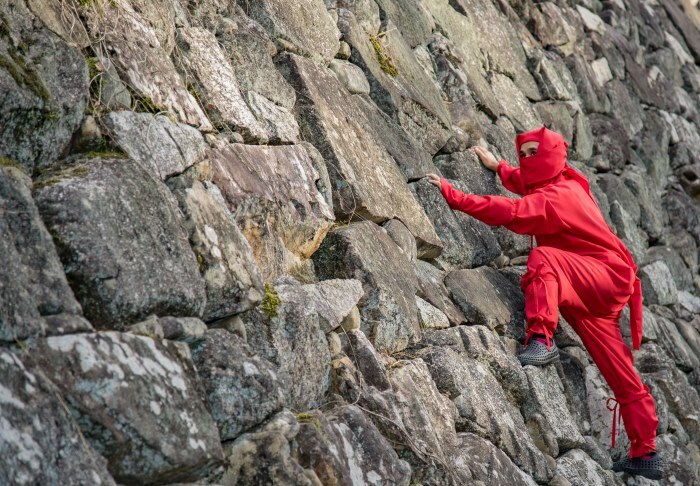 (JP) Link: Numerous Thefts by a Man Who Can Climb Five Flights in a Minute...Moves Like a "Ninja"
Online reaction to Nishimura's arrest oscillated between impressed ("There are still real life ninjas!") to sad ("If he'd only taken the use of his abilities in another direction..."). After all, not everyone who engages in strength training has the physical agility or plain lack of fear required to scale buildings. Japan is in the midst of a strength training boom, with the mode of exercise more popular than it's ever been. According to a survey by Japanese entertainment site Sirabee, a little over 18% of Japanese men and women between ages 20 and 60 report that they regularly engage in strength training. For the 20-23 age group, the percentage rises closer to 30%. (JP) Link: The Weightlifting Guy Dubbed a "Ninja" - Upon His Arrest, A Lament of "If He'd Only Pursued Something Different..."
Japan's customer service is world famous, but some Japanese commentators wonder whether the country has gone too far.